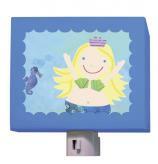 Mermaids Growth Chart by Oopsy daisy - You will treasure this mermaid growth chart. Like all Oopsy daisy growth charts, it is made using the Giclee printing process. It's almost indistinguishable from the original painting. 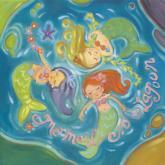 The Mermaids Growth Chart is a beautiful piece of art that will brighten your child's room. Because it's made of museum quality canvas, this mermaid growth chart can be rolled up and preserved in your child's memory box. When you have grandchildren, you can pull it out and have fun comparing milestones. A portion of every Oopsy daisy growth chart purchase goes to children's charities. Made in the USA. 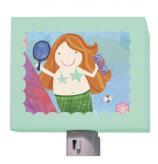 Full Description Mermaids Growth Chart by Oopsy daisy - You will treasure this mermaid growth chart. Like all Oopsy daisy growth charts, it is made using the Giclee printing process. It's almost indistinguishable from the original painting. 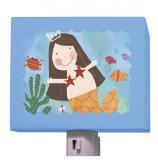 The Mermaids Growth Chart is a beautiful piece of art that will brighten your child's room. Because it's made of museum quality canvas, this mermaid growth chart can be rolled up and preserved in your child's memory box. When you have grandchildren, you can pull it out and have fun comparing milestones. A portion of every Oopsy daisy growth chart purchase goes to children's charities. Made in the USA.